Scopelist customers can now enjoy easy financing on rifle scopes, binoculars and other non-firearm products using PayPal Credit. It is available if you make a PayPal invoice request or Make An Offer. This financing is available for non-firearms only. We're also exploring other ways of financing to make your shopping experience even better. Here is how you need to go about it. Please follow these simple steps to get started. After receiving the invoice, you can verify the product, its pricing, the discount applied and the final amount you have to pay. When ready, click on Pay Invoice to go ahead with the purchase. Pay with a debit or credit card, or PayPal Credit. Here is the choice if you are paying by PayPal acount. 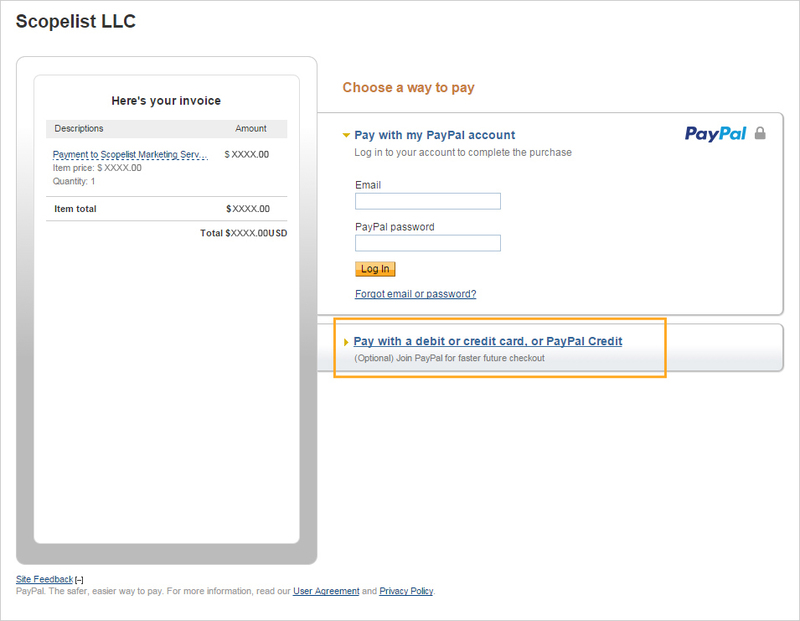 If you choose to login with PayPal, fill in your email address and PayPal password. This will be followed by the option of purchasing from PayPal Credit, Credit Card or your bank account. You will have to opt for PayPal Credit option, answer few questions and submit. You'll know in an instant if you're approved. 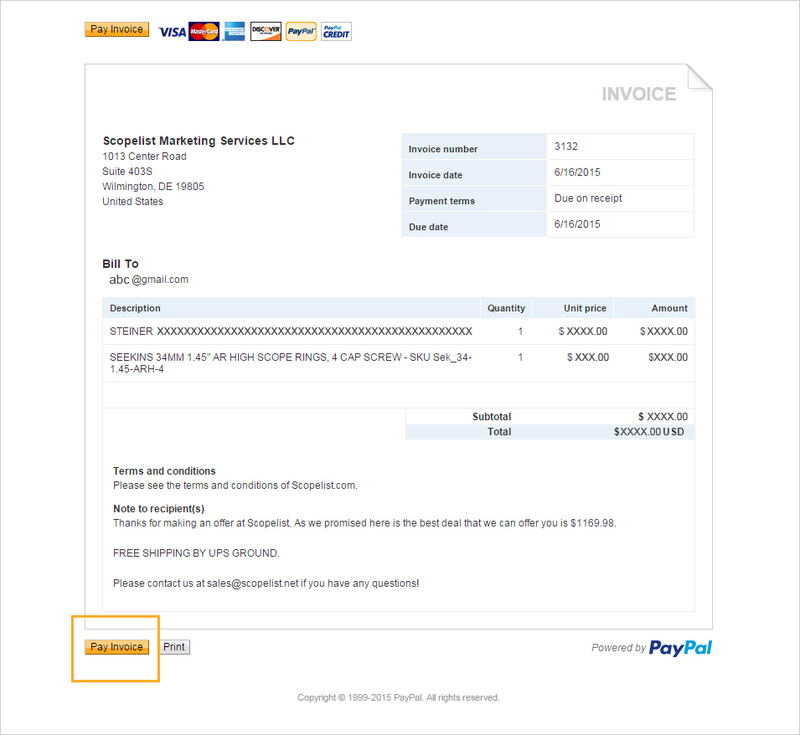 If approved, you will receive PayPal Credit statement in your registered email. If you do not wish to log in with PayPal or do not have a PayPal account, you can click on the box below the PayPal option. 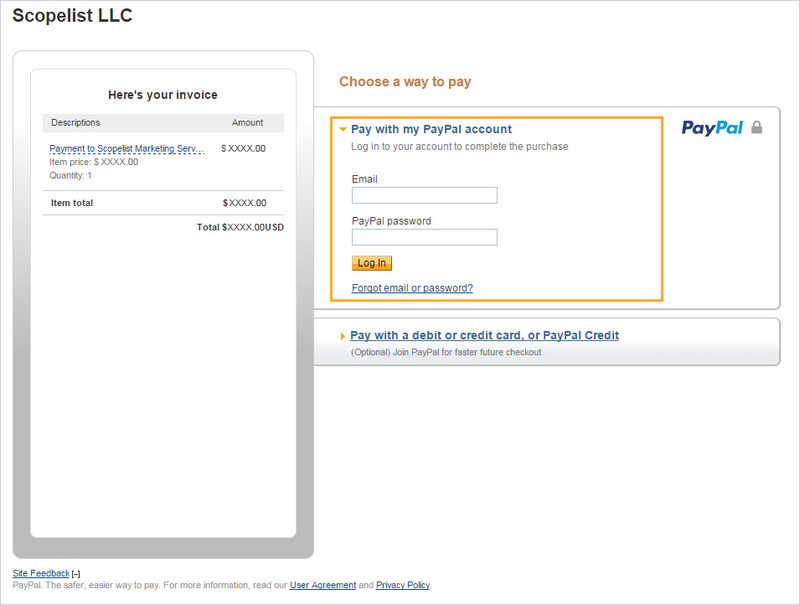 This will also allow you to pay by credit without signing in PayPal. If you require help, call PayPal Credit customer service at 1-866-528-3733 and mention the invoice along with the details. At present the financing option is restricted to non-firearms only. But we will come up with the same option for firearms very soon. Select the mode of payment and checkout accordingly to purchase your favorite hunting gear without any hiccups from Scopelist.com. We hope you have a pleasant shopping experience. Please contact us or call us at (866) 271- 7212 if you have any questions.